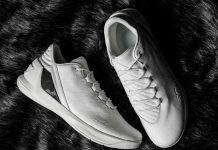 Under Armour releases a Curry 1 Lux Gucci colorway that’s actually not affiliate with the luxury brand, but does don the colors. Dressed in a Dark Green, Red, Gold and Black color scheme. This Under Armour Curry Lux features a full premium suede upper that includes leather inner lining and Metallic Gold heel counter. Check out the detailed images below and you can now find the Under Armour Curry 1 Lux “Gucci” available now through select UA retail stores like YCMC. The retail price tag is set at $150 USD.